The mechanisms and standards for controlling and regulating noise depend on the nature of the source, e.g., road traffic noise is controlled and assessed quite differently to factory noise or noise from a night club. Equally, construction noise, recreational noise and ‘neighbour noise’ may need to be assessed using different criteria and standards. Throughout industry, noise control measures are often required to protect the hearing of workers. On the other hand, environmental noise control generally gives priority to protecting Noise Sensitive Locations (NSLs) or noise sensitive receptors. • The likely duration of the noise and the ability and/or willingness to control its impact. The above list is by no means exhaustive and many social, psychological and economic factors will affect the sensitivity of an individual or a situation over time. At some facilities the nature of the activities or the proximity of of NSLs may result in potential noise problems. In such cases, the key environmental noise issues (dominant sources, noisy production processes etc. and their impact on noise sensitive locations) need to be identified. At such facilities it is important to adopt a logical and systematic approach to noise management. At some sites a combination of factors (e.g. inherently quiet plant, effective containment of noisy sources or remoteness of NSLs) ensures that environmental noise is a minor issue and significant noise impacts are unlikely to arise. However, some plants will require an ongoing programme of work to ensure an effective level of control over the facility’s noise emissions. In some instances this is best achieved through a structured Noise Management Programme (or Noise Management Plan) based on a risk assessment approach. The first step generally involves an assessment of any existing or planned noise sources and their relative contribution to ambient levels. This facilitates the establishment of target noise levels for the particular source and where necessary the degree of noise attenuation can be estimated. 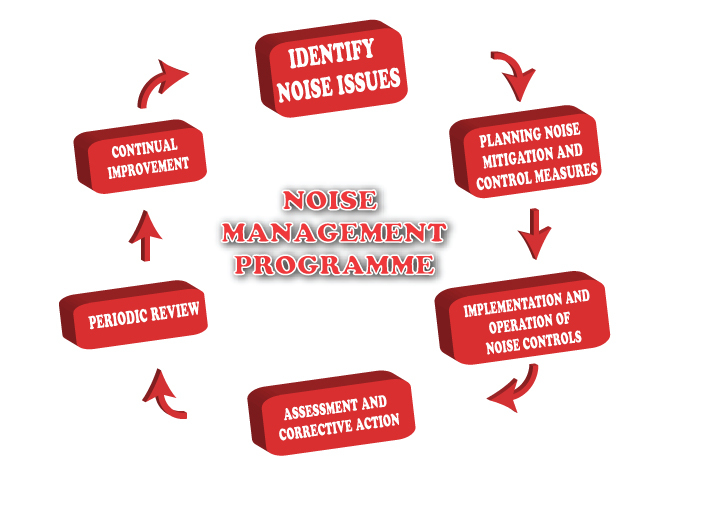 Having established the required reduction, the next stage is the application of noise control engineering principles. However, effective planning and management frequently involves the use of common sense and good practice as opposed to high tech engineering solutions. Virtually all noise control problems can be represented by a simple energy flow diagram. This generally gives rise to two main options of control, i.e. to reduce the source strength or to impede the acoustic energy along its transmission path. In every situation the mechanisms by which a sound is generated and the exact part of the machinery/equipment responsible will largely dictate the treatment options. With the exception of aerodynamic noise, noise is generally caused by a force causing a surface to vibrate. Surfaces or panels radiate sound most efficiently at or near any of their modal or resonant frequencies and some control measures involve the application of coatings or damping layers or mechanical stiffening devices which subdivide the panel so that the modal frequencies move upwards and become less problematical. increase in damping – i.e., a process whereby vibrational energy is converted into heat through some form of frictional mechanism (e.g. constrained or unconstrained layer damping techniques). Many noise sources such as industrial machinery have a fixed design which may be difficult to modify without reducing its performance or efficiency, however, noise is frequently caused by the turbulent flow of gases and fluids and these types of noise sources can be modified to reduce their noise output. Common examples of these include exhausts and blow-offs of air or steam which cause jet noise. Other common examples include turbulence caused by control valves in pipelines. In most systems the noise emission is directly proportional to the degree of turbulence and many control techniques aim to reduce the velocity and pressure of the fluids and smooth out the flow.